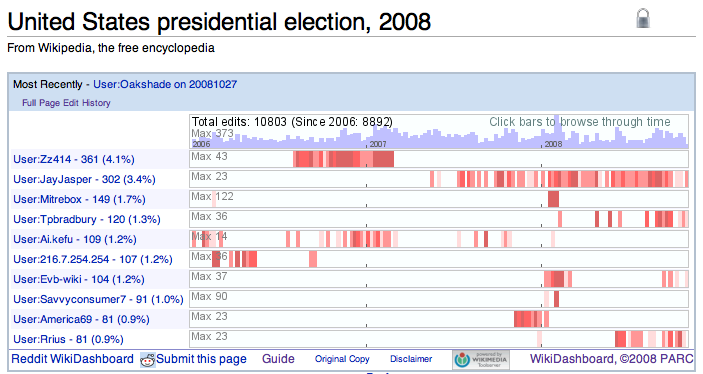 Ed Chi has posted again to the PARC ASC Blog about WikiDashboard. 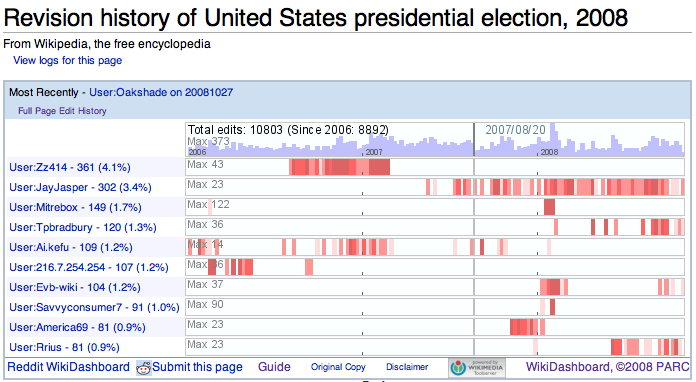 This time, he’s announced the new version of WikiDashboard that pulls live data from Wikipedia using the Wikipedia Toolserver. Instead of a local copy of the dataset from Wikipedia (that is instantly out of date), this version queries the Wikipedia database itself. This is especially exciting to me, since this is a lot of the code I worked on this summer, now in production. The activity graphs are now clickable – pulling you deeper into the context and timeline of the wiki edits of a page you want to explore. This type of digging into historical versioned data will only become more and more common. We are generating versioned data all the time, and these views allow for critical analysis and sythesis as we move forward. I’m proud to be a part of it. Let me know what you find using these new tools. Posted by Terrell Russell on Tuesday, October 28, 2008, at 12:09 am. Filed under live, parc, toolserver, wikidashboard. Follow any responses to this post with its comments RSS feed. Both comments and trackbacks are currently closed.